Several hundred miles off the Pacific Northwest coast, a small tectonic plate called the Juan de Fuca is slowly sliding under the North American continent. This subduction has created a collision zone with the potential to generate huge earthquakes and accompanying tsunamis, which happen when faulted rock abruptly shoves the ocean out of its way. In fact, this region represents the single greatest geophysical hazard to the continental United States; quakes centered here could register as hundreds of times more damaging than even a big temblor on the San Andreas Fault. Not surprisingly, scientists are interested in understanding as much as they can about the Juan de Fuca Plate. This microplate is "born" just 300 miles off the coast, at a long range of underwater volcanoes that produce new crust from melt generated deep below. Part of the global mid-ocean ridge system that encircles the planet, these regions generate 70 percent of the Earth's tectonic plates. However, because the chains of volcanoes lie more than a mile beneath the sea surface, scientists know surprisingly little about them. UC Santa Barbara geophysicist Zachary Eilon and his co-author Geoff Abers at Cornell University have conducted new research—using a novel measurement technique—that has revealed a strong signal of seismic attenuation or energy loss at the mid-ocean ridge where the Juan de Fuca Plate is created. The researchers' attenuation data imply that molten rock here is found even deeper within the Earth than scientists had previously thought. This in turn helps scientists understand the processes by which Earth's tectonic plates are built, as well as the deep plumbing of volcanic systems. The results of the work appear in the journal Science Advances. "We've never had the ability to measure attenuation this way at a mid-ocean ridge before, and the magnitude of the signal tells us that it can't be explained by shallow structure," said Eilon, an assistant professor in UCSB's Department of Earth Science. "Whatever is down there causing all this seismic energy to be lost extends really deep, at least 200 kilometers beneath the surface. That's unexpected, because we think of the processes that give rise to this—particularly the effect of melting beneath the surface—as being shallow, confined to 60 km or less." 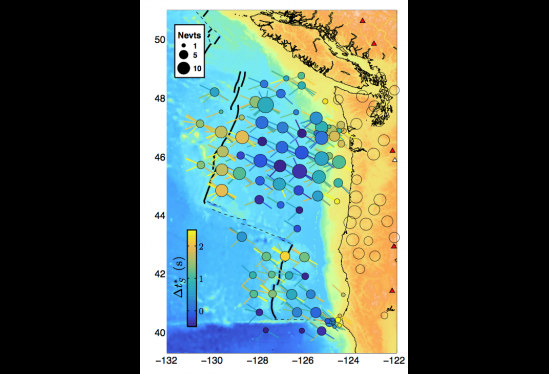 According to Eilon's calculations, the narrow strip underneath the mid-ocean ridge, where hot rock wells up to generate the Juan de Fuca Plate, has very high attenuation. In fact, its levels are as high as scientists have seen anywhere on the planet. His findings also suggest that the plate is cooling faster than expected, which affects the friction at the collision zone and the resulting size of any potential megaquake. Seismic waves begin at an earthquake and radiate away from it. As they disperse, they lose energy. Some of that loss is simply due to spreading out, but another parameter also affects energy loss. Called the quality factor, it essentially describes how squishy the Earth is, Eilon said. He used the analogy of a bell to explain how the quality factor works. "If I were to give you a well-made bell and you were to strike it once, it would ring for a long time," he explained. "That's because very little of the energy is actually being lost with each oscillation as the bell rings. That's very low attenuation, very high quality. But if I give you a poorly made bell and you strike it once, the oscillations will die out very quickly. That's high attenuation, low quality." Eilon looked at the way different frequencies of seismic waves attenuated at different rates. "We looked not only at how much energy is lost but also at the different amounts by which various frequencies are delayed," he explained. "This new, more robust way of measuring attenuation is a breakthrough that can be applied in other systems around the world. "Attenuation is a very hard thing to measure, which is why a lot of people ignore it," Eilon added. "But it gives us a huge amount of new information about the Earth's interior that we wouldn't have otherwise." 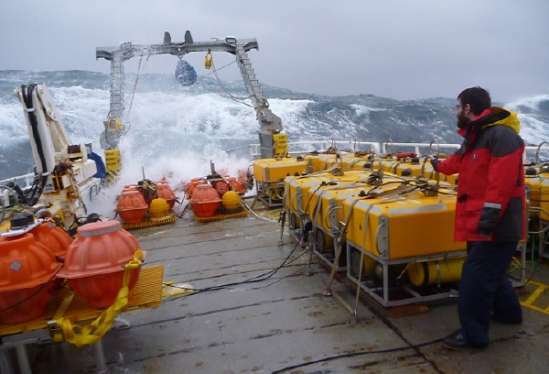 Next year, Eilon will be part of an international effort to instrument large unexplored swaths of the Pacific with ocean bottom seismometers. Once that data has been collected, he will apply the techniques he developed on the Juan de Fuca in the hope of learning more about what lies beneath the seafloor in the old oceans, where mysterious undulations in the Earth's gravity field have been measured. "These new ocean bottom data, which are really coming out of technological advances in the instrumentation community, will give us new abilities to see through the ocean floor," Eilon said. "This is huge because 70 percent of the Earth's surface is covered by water and we've largely been blind to it—until now. "The Pacific Northwest project was an incredibly ambitious community experiment," he said. "Just imagine the sort of things we'll find out once we start to put these instruments in other places."